I hate to wish time away, especially as I’m always saying how life is so short and we must enjoy it to the full, however, I must admit I am wishing the next few weeks go by quickly until I can get out of this shoulder immobiliser which, as the name implies, is leaving me rather ‘immobile’ (see last’s weeks blog for an explanation as to how I came to be like this). As I also mentioned in last week’s blog, not being one to be able to sit around doing nothing and feeling sorry for myself, I’ve been racking my brains where I could go for a walk that doesn’t involve snow, ice, using crampons, hiking poles etc. – none of which are currently feasible for me. Then I had my ‘eureka’ moment when I remembered some years back having driven up the road to the hut (though it is far from a hut, more a large home) ‘Dom Pristava‘, from where, at that time, I then made an onwards hike into the surrounding mountains of the Karavanke range – the most popular of which is Golica famed for its annual carpet of white daffodils every Spring and many buildings and other objects in this part bear the symbol of a daffodil – including the Dom (as seen below). So, since I’m currently unable to drive, I took a bus from Radovljica early one morning, which arrived on time to-the-minute, alighting at Koroška Bela, then proceeded to walk up the road, first through the village itself, then to Javorniški rovt, before reaching the Dom situated at 975m. It only took a little over an hour but it sure felt good to get the calves working and heart pumping fast again! From the Dom there are numerous paths in all directions, however, tempted as I may have been, I was sensible and returned the way I had come, especially since all the routes ahead were snow- and/or ice-covered. There is, however, an alternative, more scenic, way to reach Dom Pristava, by taking the path ‘Gajškova pot’ which begins in the village of Koroška bela and leads 4km up through the forest taking 1-1.5 hours. 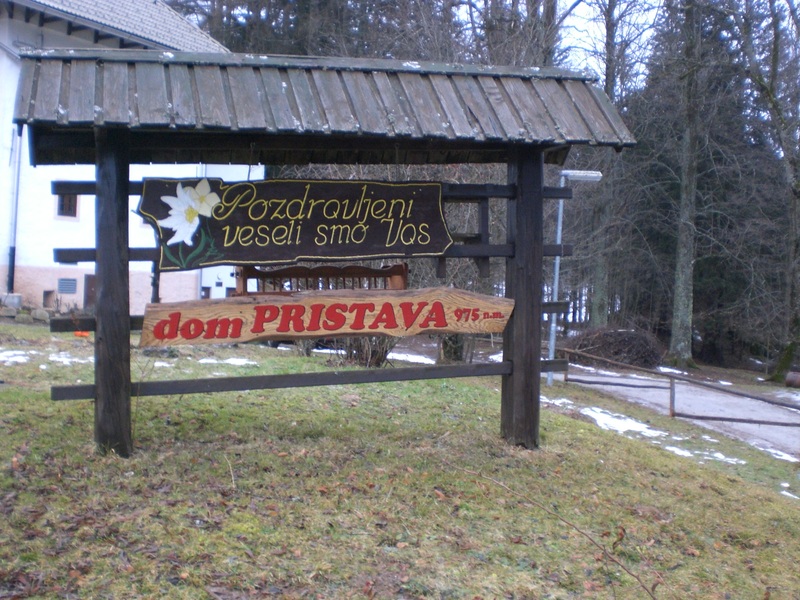 Dom Pristava can be either a destination in itself; you can walk up and enjoy a look around the Zois Park and surroundings and enjoy some traditional hearty Slovene food such as štruklji, stews, and farmer’s feast, or it can be a start point for walks higher into the surrounding Karavanke range such as Golica, Stol, Vajnež and Dovška baba. The Zois Park was formerly the botanical garden of the amateur botanist, Karel Zois (1756-1799). Today, the Park is part of the Natural and Mining Educational Trail that which also leads past Dom Trilobit, to where I made a detour to on my return, which serves as a centre for school trips and extra-curricular activities, nature excursions etc. 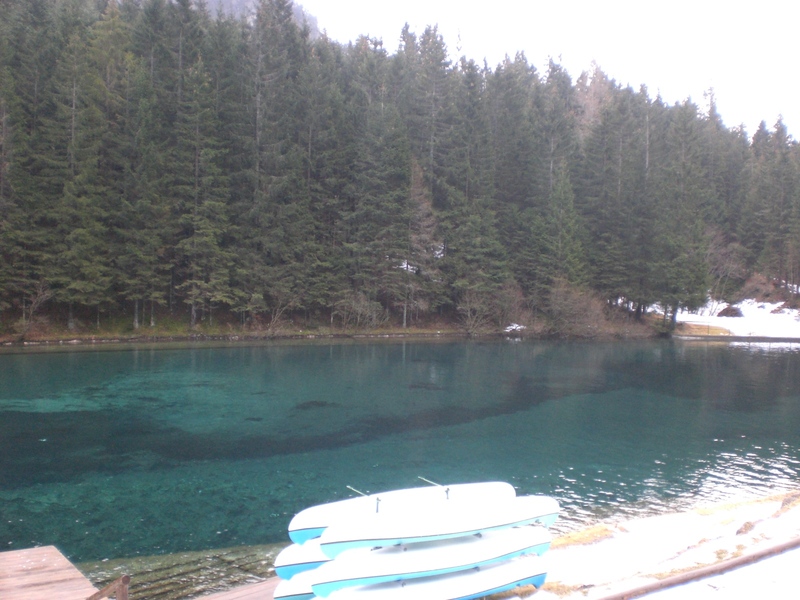 and is right next to a small, emerald-green artificial lake. On returning to the village, I had a little time to kill before the return bus so I took the opportunity to look around the village. Koroška Bela, unfortunately, doesn’t occupy the most favourable position as the village is directly opposite the Acroni steel factory which is constantly pumping out smoke from its large chimneys and is a bit of an eyesore. 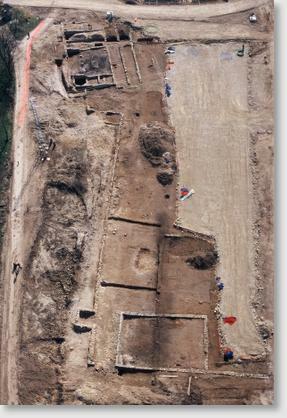 Thus, it is easy to dismiss and overlook the village, as I admit to having done until now. 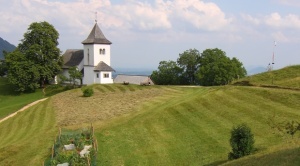 However, having recently translated a part of the new Transnational Church Route – the part featuring 11 selected churches in Gorenjska – one of them being the church in Koroška Bela, I had an added interest in going for a closer look. 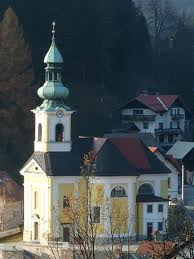 The Gothic Church of St. Ingenuim and Albuin dates from at least the middle of the 14th century and is the only church in Slovenia, and indeed the only church outside of the Tyrol, which is dedicated to Saints Ingenuin and Albuin. It’s hidden away in the upper-part of the village which I didn’t know even existed until now so I’m pleased I got the opportunity to see it and discover that, actually, once away from the factory and plumes of smoke, there is more to Koroška Bela than first meets the eye, including a small memorial park. So, almost 2 weeks into my recovery time, I’m managing to stay relatively sane and at least a little fit. The weather too has been on my side as it’s been almost spring like this past week with temperatures above the seasonal norm and a few little spring flowers starting to pop up from the undergrowth. However, I’m not fooled and not being lulled into believing winter is over yet as the past couple of years the bulk of the snow has come in February so I’m sure winter still has a sting in its tail to come, in fact, snow is forecast for later this week…..
I’m afraid it will be at least 6 weeks or so until I’ll be able to blog about any of my latest hikes and adventures as, unfortunately, on Monday last week I fell on ice and now have a fractured humerus – which believe me is anything but ‘humorous’! If I wasn’t already paranoid enough about ice, now I will be even more so and this year, since the snow fall at the end of December, the ice has been particularly bad, though, following heavy rain this past weekend much of it in the valley has, thankfully, finally melted. I wasn’t doing anything dramatic or particularly adventurous when I fell and, annoyingly, had had my crampons on until just minutes before, having removed them for the final part of the path down which, being on the sunny side, had been ‘ice-free’ – or so it seemed – for a week or so. However, there was just one small spot, just a few metres, where there was a little ice mixed with mud and that was my downfall – literally. At first I thought/hoped I might have just torn the tendons and was praying the pain would dissipate. However, some hours later it was evident that wasn’t going to happen so it was time for the inevitable trip to the on-call doctor, followed by x-rays at A&E, to confirm that, yes, I had actually broken a bone. ‘Bugger’ – just one of the expletives I might have uttered and probably the only one that is suitable for print! So now follows 6 long, frustrating weeks of being one-armed which, when you live alone, is anything but easy. Simple, every day tasks become torturous, not due to pain – thankfully and strangely it doesn’t really hurt – just due to the length of time it takes to do the simplest of things; getting dressed, showered etc. Still, I’m trying to remain as upbeat as I can and at least I can still get outdoors for a walk, albeit not exactly the type of walk I would choose and running and cycling are off the agenda, though, being winter I wouldn’t be doing much of that anyway. 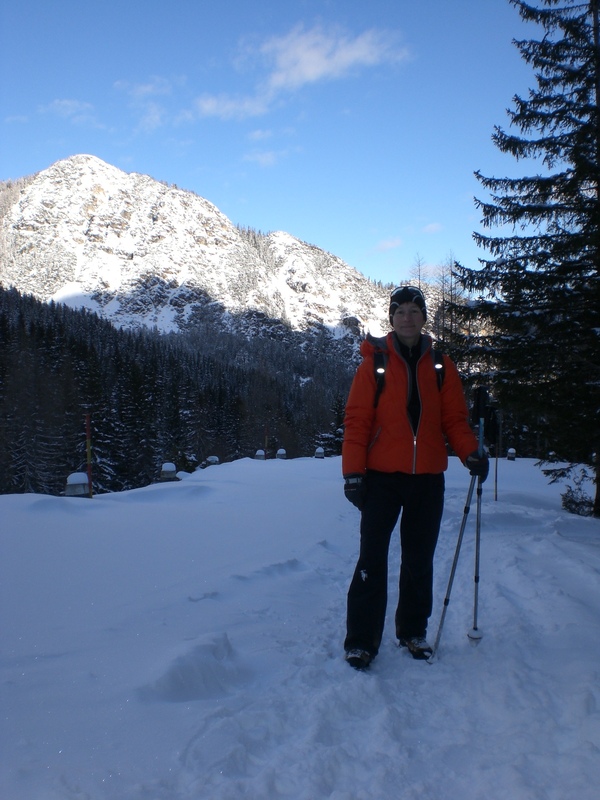 Here are a couple of photos of me on a winter’s hike – taken a couple of year’s ago – to the very same place – believe it or not! I will, of course, still be blogging – what is it they say about ‘not being able to keep a good man/woman down’? In the meantime, I’ll also be getting my thinking cap on, availing of public transport (driving is now out of the question too) and being thankful, once again, that I live in Radovljica which is well served by public transport and offers plenty of places to walk – even for those of us who are, temporarily at least, somewhat less mobile. Snowy Hikes and Winter Bites! It was a very chilly start to 2015 with temperatures midweek well into minus figures. 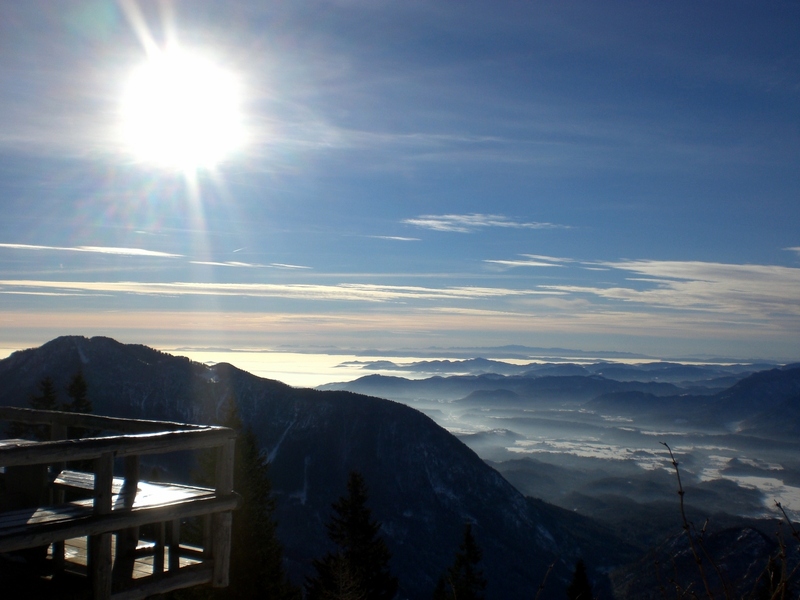 Babno polje, which regularly measures the coldest temperatures in Slovenia, was minus 24 degrees, whilst Celje wasn’t far behind with minus 19. 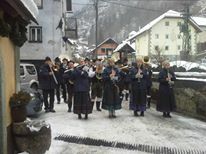 Here in Radovljica it was a (balmy!) minus 15! Fortunately, on Friday the polar temperatures subsided a little and the temperatures in some parts of the country even got into positive numbers during the day. 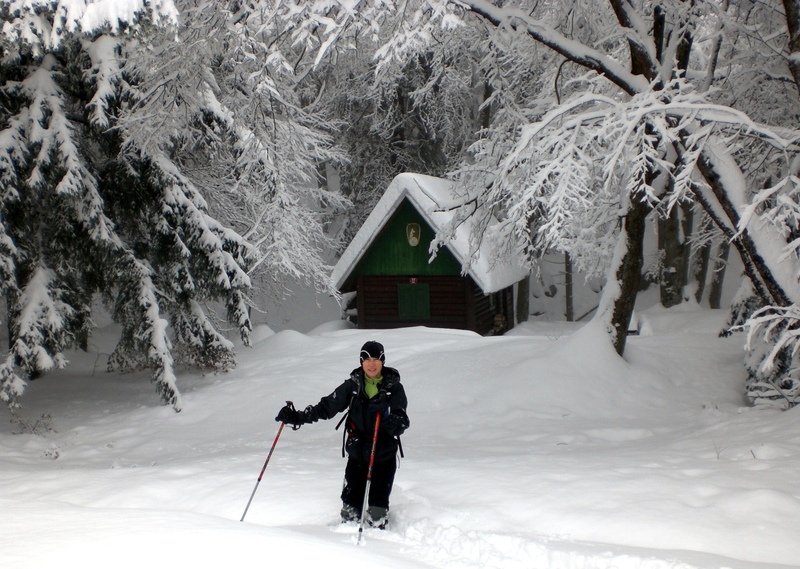 Having not strayed too far from home for a few days, due to the cold, snow and bitter wind, I was itching to get out and therefore was mighty pleased to be able to make the hike up to one of my favourite winter destinations, the mountain hut Roblek dom, located on the western slopes of mount Begunščica, part of the Karavanke range. 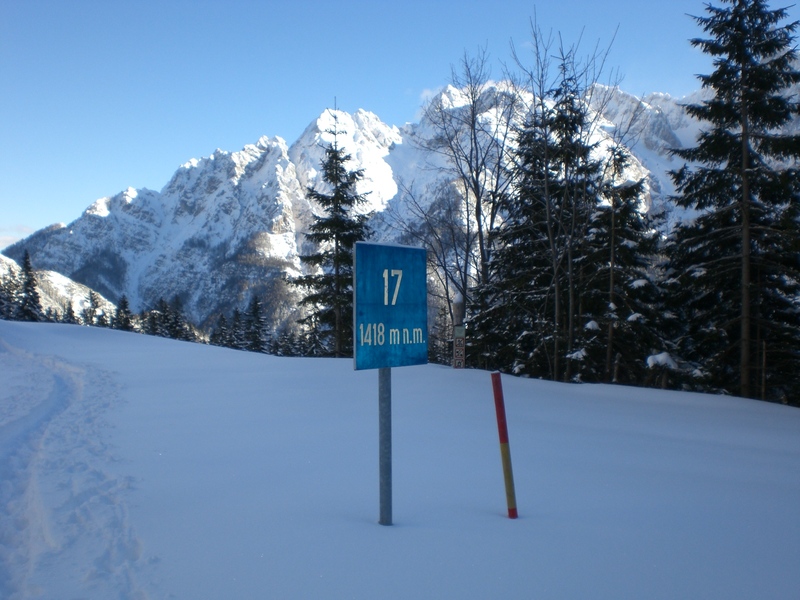 The route up to the hut is popular all year round and can be approached from several directions, however, the safest and only really viable route when there is heavy snow, is to begin from the Draga valley and continue up to the hut at 1672m. 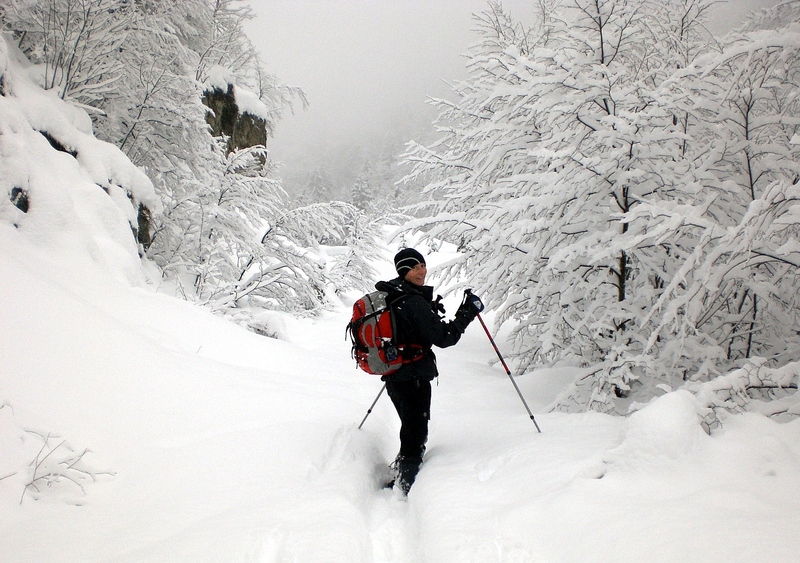 During the winter you may share the lower part of the path, the part which is on the road, with sledgers, before the path veers off, steeply in places, into the forest. Probably the reason it is such a popular destination is also the relative wideness and safeness of the path as it is not in an area prone to avalanches (I’m of course touching wood as I write this! ), the path is well-trodden and you are rarely alone en-route or at the top; there’s always someone to pass the time of day with. 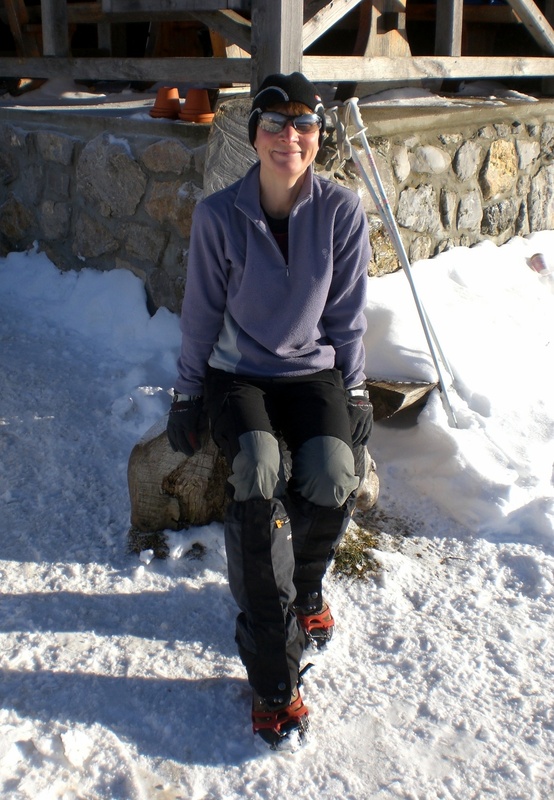 However, it should be noted that at present the path is treacherously icy in places and a pair of small crampons really are a must. On reaching the hut, the thermometer showed +4 degrees, which is almost 20 degrees warmer than it had been in the valley during the previous few days so actually felt remarkably warm. I’m not usually the greatest at taking pictures but, if I say so myself, this one below (on the left) isn’t a bad effort – though of course these days the camera does most of the work and I can just ‘point and click’! 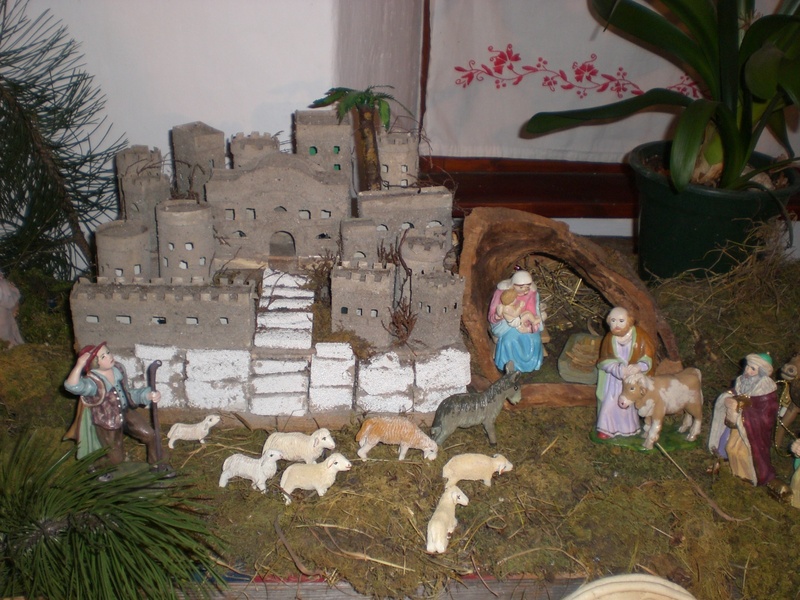 During the festive season, it is a tradition in many households in Slovenia to construct nativity scenes made out of various materials such as wood and moss. In the village of Rodine, just a few kilometres from Radovljica, more precisely in Jalnova hiša (Jalen’s House), the birthplace of the Slovene writer and priest, Janez Jalen (1891-1966), an impressive displays of nativity scenes of all shapes and sizes is set up each year. 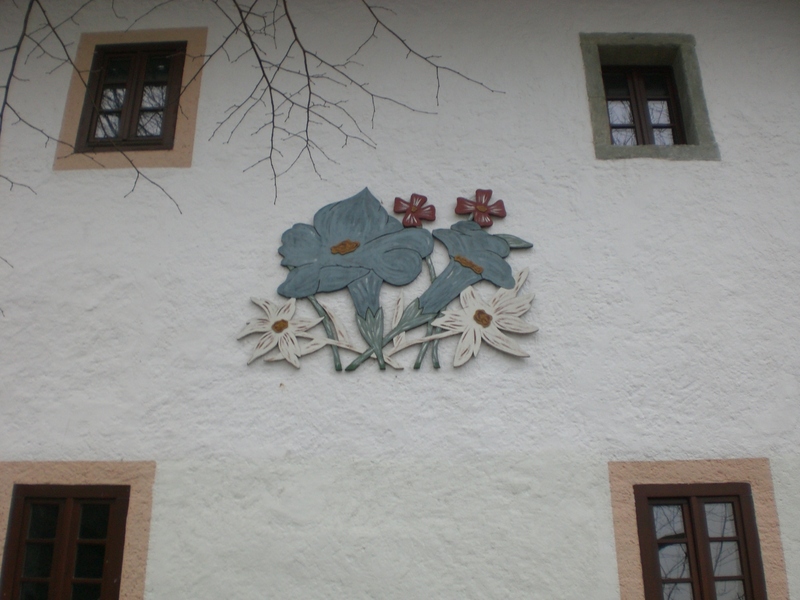 These days the house also operates partly as a museum with an exhibition about his life and work, and it also forms part of the Žirovnica Route of Cultural Heritage – http://www.zirovnica.eu/dozivetja/tematske-poti/pot-kulturne-dediscine/znamenitosti-na-poti/ (Slovene), OR http://en.zirovnica.eu/ (English). 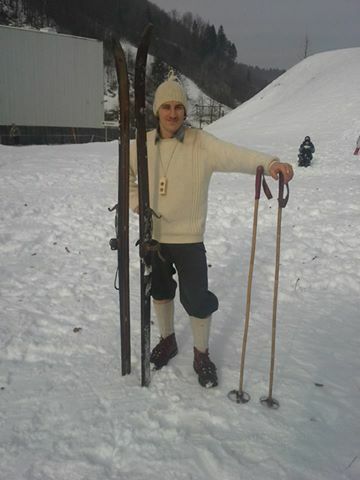 The owner is more than happy to greet visitors and show them around. During this period, the exhibition is open daily for visitors, this year until 10th January (daily from 10am-6pm), so there is still time to visit. There is also a traditional black kitchen. Entrance is free. People often ask me if I ever run out of ideas for what to write about in my blog. Well, thankfully so far that hasn’t happened and I hope it won’t for a while yet. So, its onwards into another year and I hope you’ll continue to join me on the journey….